One of the more plausible solutions to the mystery of the ‘Mary Celeste’ is as follows. A small fire and a strong smell of fumes had led the ship’s Captain to believe that his entire cargo of denatured alcohol was about to catch fire and explode. He panicked and ordered the crew to abandon ship. If he had remained calm, the fire could easily have been extinguished and the cargo made safe. As it was, neither he nor the crew were ever seen again. 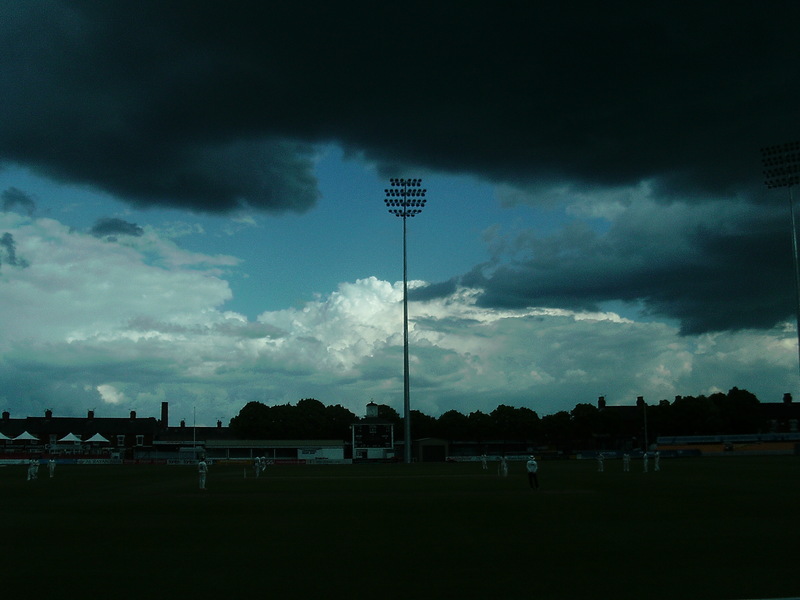 Anyone dropping in at Grace Road at tea on Tuesday afternoon would have been confronted by a similar mystery. The ground was deserted, the covers were on with no sign of rain, and still warm trays of chips and recently discarded lolly sticks indicated that it had been hurriedly and unexpectedly abandoned. Nothing in the ship’s log of the ‘Mary Celeste’ offered a clue as to the coming disaster, and nothing in the scorebook for the first two days’ play suggested much untoward at Grace Road. 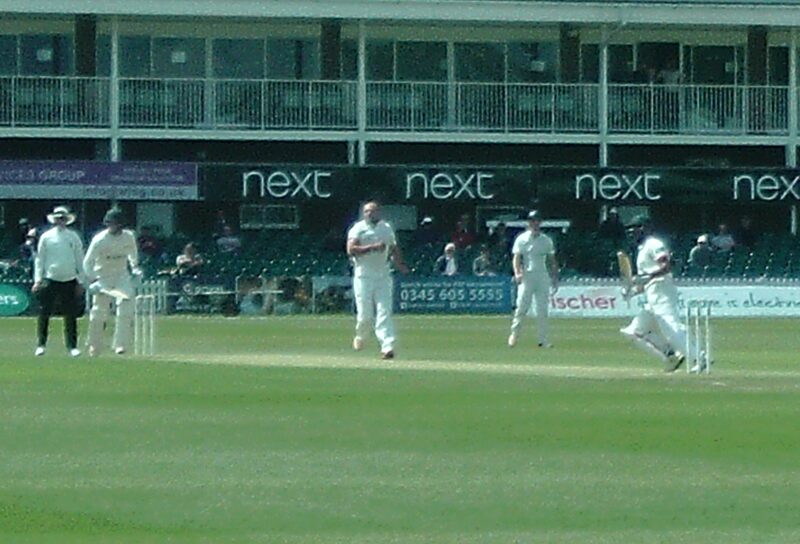 Leicestershire had begun more than comfortably at 243-3. 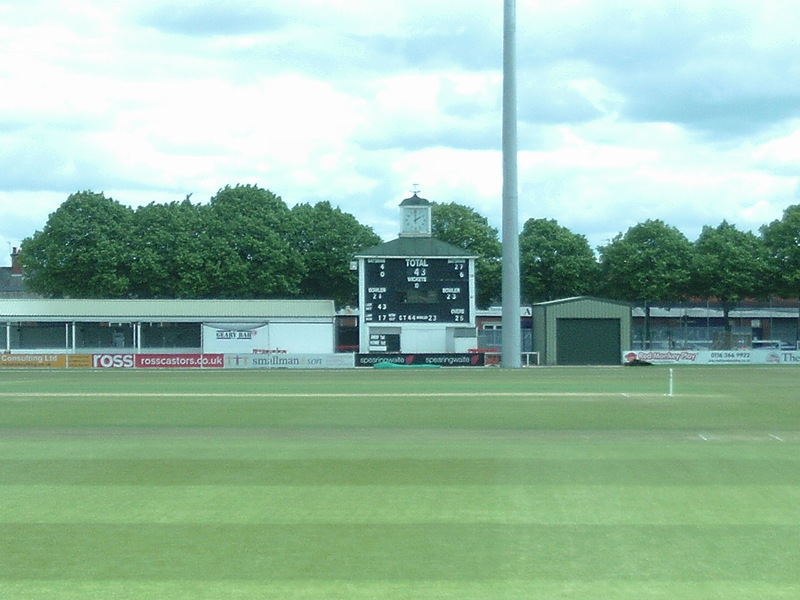 There were some signs that batting was not as easy as the Leicestershire top order had made it seem (some balls kept a little low) when Joe Leach took five wickets to bowl them out for 313 and Worcestershire, in turn, could only muster 274. I had felt some slight sense of foreboding when I had woken at 5.00 to a carpet of fog (even the best covers can do little to prevent fog creeping under them), but it had burnt off by breakfast-time and, on my way to the ground, I was considering writing about the difficulty of finding the right tone in which to write about a Leicestershire victory. If the pitch was playing up a little, then 200, or even 150 to add to their first-innings lead should do, and a side as experienced as ours should have no difficulty with that (I thought). The first Leicestershire wicket to fall (Horton snicking an outswinger to slip) was regrettable, but no great cause for alarm. The second, though, was the equivalent of that small fire in the ‘Mary Celeste’. A ball from Leach sprang up alarmingly, caught Neil Dexter’s bat on the splice and spiralled to point. This seemed to lead them to believe that the pitch was deteriorating rapidly and panic set in. Cosgrove played an inexplicably airy drive at a straight ball and was bowled for 0 to take them to 4-3 with their three best batsmen already gone. Robson and Wells were trapped LBW, apparently paralysed with fear by balls that kept slightly low. Pettini and Aadil Ali, perhaps thinking that suicidal singles were their only hope of scoring, ran themselves out. Niall O’Brien did his best to stem the lemming-flow, but it was a hopeless task and the innings closed , shortly before lunch, on 43. Most of the damage (when not purely self-inflicted) was caused by Joe “Leachy” Leach, who finished with match figures of 9-109 . Cricinfo uses one of the obvious words to describe him, which is “bustling“; another would be “burly“. He bustles, he hustles, he doesn’t shave too often and he likes to return the ball to the wicket-keeper as close to the batsman’s head as possible. I don’t remember him going in for too many verbals, but – given that he has a degree in French and philosophy – he might have chosen to instill a sense of existential dread in the batsmen’s minds by flinging a few of the more uncomfortable thoughts from “L’être et le néant” at them. Leach is the kind of player whom County supporters adore, if only because he looks, from the boundary, as if he might be one of them. In reality he is 6’1″ and built like a prop forward, but, compared to the wand-like gymn-bunny physiques of most modern players, he is shaped roughly like Benny the Ball. Or, as one of the gatemen (a keen student of the game) said to me “He shouldn’t be taking all these wickets – he’s just a stock bowler. Look at his backside!”. (or perhaps he confounded Cosgrove further by engaging him in a conversation about whether Pascal’s Wager is covered by the ICC’s anti-corruption regulations). Cosgrove gave a fairly acute assessment of the game in an interview with the ‘Leicester Mercury’: “It was not acceptable … there was definitely a bit of panic … no-one was up to the task … including myself, and it bit us in the backside“. It is a truism, and I think true, that one freakishly low score is easier to recover from than a persistent string of ordinarily poor ones, but this defeat has come at an inconvenient time. 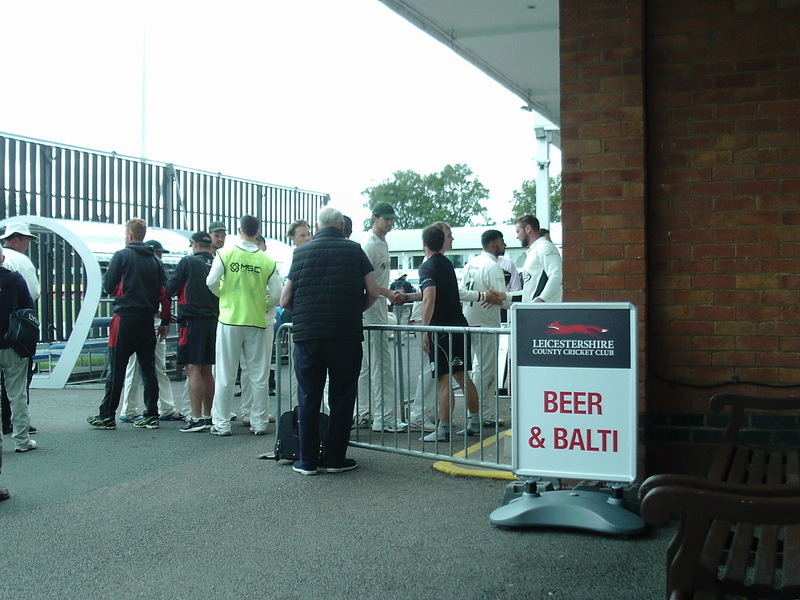 Tuesday morning was the first session I have seen this season where Leicestershire were not in control ; they have played five matches and dominated four of them, but have only one win to show for it. After one more 4-day fixture (trickily away at Canterbury), the season then enters the Bermuda Triangle where the odd Championship match is slotted in amongst a slew of 20 and 50 over games, and they may struggle to keep their bearings. I have (almost) every confidence that they will be able to regain their early season strength when the Championship reconvenes properly in August, but I’m afraid there are some Members who do not share my faith, and who think that, once again, there are dark clouds gathering above Grace Road.